There is nothing that bonds all the dental team together better than having your flu shots at work! April is the ideal time to arrange your flu shots. The peak season for flu is late July August so having the flu shot now means you will build up immunity by the time the risk of catching the flu is greatest. The ADA’s latest News Bulletin outlined the requirements for Dental Staff immunisation. SmartDentist subscribers have an easy way to meet staff immunisation obligations. 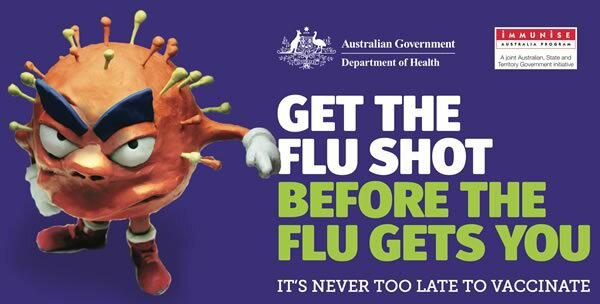 To find out more you and your staff can do an online training course on the flu and your immunisation obligations. This will earn you CPD points as well! Dental practices with accreditation need to fulfil staff training obligations so encourage each staff member to learn and join in the conversation about immunisation, the flu and infection control. Queensland Health now require job applicants for dental roles to supply evidence of vaccination or evidence that they are not susceptible to prescribed vaccine preventable diseases. Dental practices would be wise to follow the lead of Queensland health and use their pre-employment forms and their evidence criteria (all available online). SmartDentist has pre-employment forms and recommends dental practice adopt this vaccination requirement for new staff. It helps streamline the practices obligations and reduces stress if a sharps injury occurs. This entry was posted in ADA, dental practice manual, Infection Control Management Plan and tagged employment, flu, immunisation by Glenda Farmer. Bookmark the permalink.